Thinking about swapping my 924 turbo for a v8. Reading up on things at the moment and trying to decide what the best route would be. Really starting to hate this cis system and thinking about swapping in a more user friendly engine to me would be better. Any help is appreciated. If i cant do the swap relativly easy i will be selling the car off instead of cutting it up to much. Instead of a V8 swap, why not add EFI via MegaSquirt? The 2.0L is not a bad engine itself and once you get rid of the CIS mess in the engine bay, there's a ton of room and the potential to make more power by more easily adding an intercooler and some extra cooling capacity. 200hp is pretty easy to reach with upwards of 400 available if you're careful with your tuning and component selection. That said, if you really want to swap in a V8, then you'll have to build your own mounts as the 944 kits use the 944's cross member mounts and the stock frame mounts of the 924 will need to be cut off to make room. The 944 V8 bell housing will bolt right on along with the 944 header kit, etc. Stock 5-lug brakes are more than sufficient, though you may want different gearing and a limited slip for the Audi 5-speed, but that's a common swap from another 944, but it won't stop you from driving the car or enjoying it. Check out http://www.texasperformanceconcepts.com/ as they are a better supplier and supporter of the DIY engine swap movement. Also they have a great forum there. Although it would be easier to simply buy a C5 Corvette and keep the 924 Turbo as a future classic, but that's just me. This car has been pilfered already other then the basics of the car. The interior is mostly missing and the drivers hing was welded to body cause someone either didnt know how to fix the bolt portion or just? I cant find much on stand alone fuel management yet for these engines. It runs pretty good just way to many tuning issues. V8 is more up my alley. Being a 924turbo im not sure if swapping to the 944 torque tube and trans would be better. 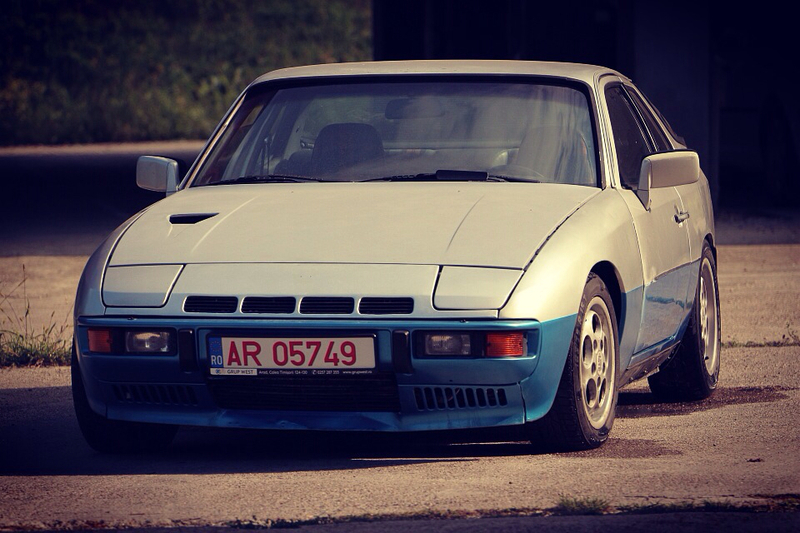 Or if the 924 turbo. Trans is fine. I know the torque tube is basically early 944 size and not the smaller early 924's. Making mounts and such is really up my alley so im good there as well. This car has been pilfered already other then the basics of the car. The interior is mostly missing and the drivers hing was welded to body cause someone either didnt know how to fix the bolt portion or just? Not uncommon, mine and many others have the same issue and have had similar repairs. I cant find much on stand alone fuel management yet for these engines. It runs pretty good just way to many tuning issues. There's threads about converting to MegaSquirt here, including sample tuning files. There's was a custom fit fuel rail available from one of the members, check the FS/W section and the 931 Tech sections. Search for MegaSquirt and you should find some threads. DIYAutotune.com sells the MegaSquirt EFI system and wiring, connectors, etc. Being a 924turbo im not sure if swapping to the 944 torque tube and trans would be better. Or if the 924 turbo. Trans is fine. I know the torque tube is basically early 944 size and not the smaller early 924's. Torque tubes are the same, only the 944 Turbo and 944 S2 Audi transaxle a are stronger than the Audi used in the 924 Turbo and 944 NA. Biggest gains are in the different gear ratios available. The 2.0 is not a bad engine except for the fact that parts are rare and expensive, the rotational assembly is heavy and creates slow revving, and the head flows like water through concrete. Other than that it's great. It is very stout but a rebuild would likely cost double what your car is worth. You could go with an Audi v8 and use your stock bellhousing but that's another expensive engine. audi v8 what years. Not that I will be going this route but I do have access to one locally. Is the trans swap to the later audi trans easy enough to do or do I need the linkage, trans, rear torsion housing, axles as well. the more I think about it the more I want the v8. Now to check weight differences between the engines as well. It will be a slow progress im sure as I will be working on other things on the car until after I move this year sometime. The 924 Turbo uses the same as Audi boxes as the 944. The later boxes use a different transaxle mount and have an electronic speedometer drive. Some parts swapping between the two and it should be a direct swap. Thanks for all the links. Ive got a bunch of reading to do. Plus need to make a decision soon on if i want to swap or let it go to someone that wants it in its form now. Im going to start the process of collecting parts for the v8 swap. In the mean time i will work on the small things to get it on the rd in it current state. The fuel injection swap stuff looks like fun but i dont think i will be happy with it all once complete. So the next year will be sourcing the parts for the swap. Sell the old engine, you'll make some money back on key items like head, pistons, even that CIS you cant get to work as you want to, turbocharger, manifolds, everything that is 924 turbo specific has a price.